Take advantage of working in a professional studio and feel free to ask for assistance. We are hosting the next toronto lampworkers dinner on Tuesday Jan 29th at 7pm. We will start off with dinner at The Mill St. Brew Pub, and follow up with a torching play time at our shop TANK. 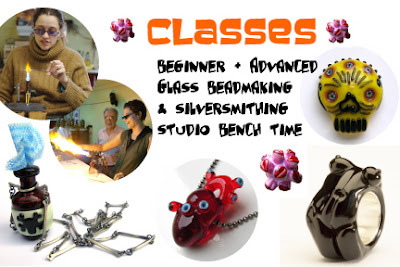 Anyone who wants to come is welcome, and you can try making a bead or just watch people demo. Bring stuff for show and tell! This meeting is free, each person pays for their own dinner at the pub. Please RSVP so I can make a reservation at the restaurant.